The Green Bay News Network was launched a little over four years ago. At that time, our goal was to provide a service to help local area residents stay in touch with local business owners. Over the last four years, we have developed a dedicated e-newsletter reader-base and visitors to our website and social media platforms. Our business partners have benefited by publishing posts relating to news updates, upcoming events, job listings and special savings and using the Green Bay News Network as a tool to communicate with area residents. While we have enjoyed the many compliments we have received, we knew we could do better. Our goal is to become the most comprehensive source of information about what’s happening in the greater Green Bay area, and to accomplish that we knew we needed to provide a superior user experience. The new site is broken down into clean sections for news, events, specials, jobs and a business directory. We paid close attention to providing device-appropriate user interfaces. With our growing community of readers who visit us from their phones, we paid special attention to providing a great mobile experience using the swipe technology to easily move from section to section. Our newsletter also has a new format which is focused on providing a clean and uncluttered look. The entire site is searchable, so you can easily find what you’re looking for. We’ve become social! 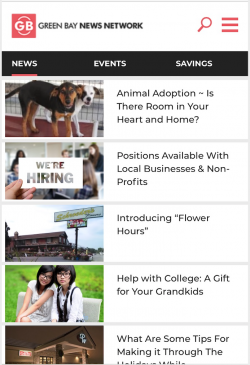 We want you to be able to share news, events, specials, jobs, etc. with your friends, co-workers, and family, and we’ve made it very easy to do so via email or social media. 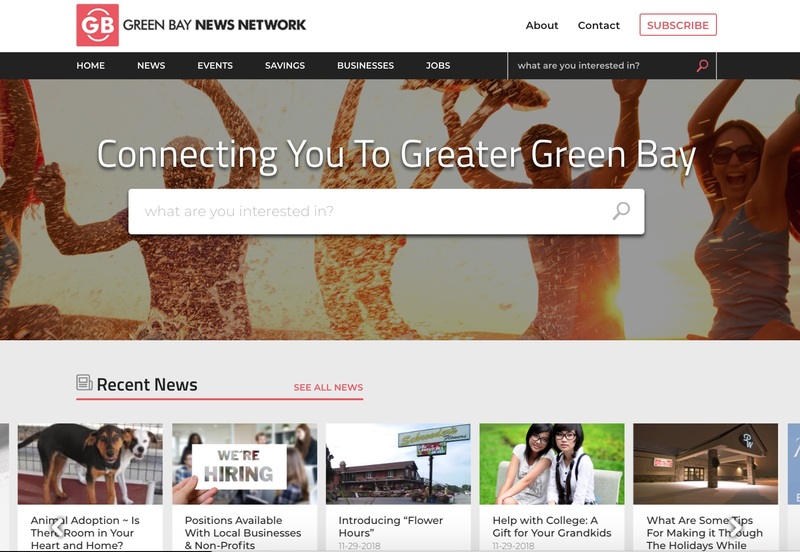 Lastly, we haven’t forgotten why we started the Green Bay News Network: Our passion for connecting you with local area businesses and community organizations is stronger than ever. At the bottom of every news post, event, job and special from one of our member organizations, you will find a connection area from which you can send an email, visit their website, get directions or give them a call. We encourage you to spread the word about the new Green Bay News Network to your friends, co-workers, and family members and invite them to subscribe to our weekly updates. Reader subscriptions are free. If you are a business owner or manager who would like to develop a tighter connection with Green Bay area residents in a very cost-effective way, send us a note. Thanks for visiting the Green Bay News Network. We look forward to serving you!